Now #1 on Google and Bing for "medical display". Your consultant to the best diagnostic and clinical displays with the greatest value. Providing you with the greatest value in medical monitors, by offering the all the major medical displays with the best pricing and support, is the premise of Medical Displays for Less. Helping you select, purchase and confidently use these medical imaging products, which supports the success of your practice and the people you serve, is our mission. We are at your service for all discussions that facilitate your satisfaction with the products and services we offer. Medical Imaging is our only business and our medical display team has tremendous technical depth and experience to make sure your needs are met. Our brick and mortar group has been serving the Radiology community for over 60 years so that names like BARCO, DOME, EIZO and TOTOKU are very familiar to us. 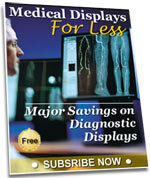 Authorized Sales and Support for the complete Medical Display lines from Barco, Dome, EIZO, NEC, Totoku and more. The BEST Quality and Prices with Expert Technical Support and Service. With Free Shipping!